I love this question! Chestnuts are one of those things that no one ever talks about, and if you weren’t born into a horsey family, you may not know anything about them. I’ve always heard that chestnuts are the remnants of toes that horses lost during evolution. My anatomy book specifically says chestnuts are versions of footpads, the cushions on which animals walk. Foot pads are quite pronounced in some animals, such as bears, and less pronounced in other animals, such as dogs and cats. In horses, the foot pad is incorporated into the hoof as the frog. 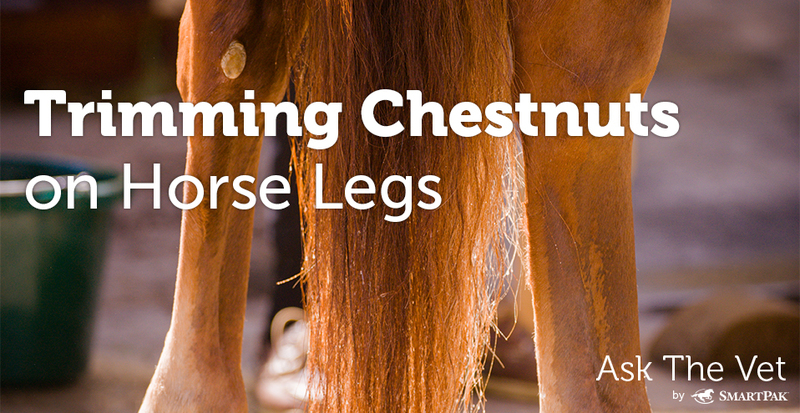 The chestnuts are described as “vestigial” knee and hock foot pads, meaning the structures have atrophied and become nonfunctional. But that doesn’t solve your problem, because the darn things still exist and continue to grow. Thankfully the horse I have now has chestnuts that remain flush with his skin and hair. They don’t ever seem to grow. But the horse before him was a different story. His chestnuts could become long and sharp, almost like the spurs on a rooster, if I didn’t keep them under control! I used to peel them off after I gave him a bath, because they were softer then. But as he got older, the chestnuts seemed to grow more sensitive, and he didn’t even like me to touch them. Luckily, I stumbled upon an excellent way of encouraging them to fall off with hardly any effort on my part: put a little petroleum jelly on them. After a day or two—if they didn’t come off on their own—they’d easily fall off if I “accidentally” hit them with a brush during grooming. Although I’ve never heard of using clippers on them as you suggest, I have had farriers trim them regularly (with a hoof knife, not nippers). And I did just read that some people prefer to sand or rasp them down. You’ll just have to experiment with what works best in your horse, because in some horses they’re quite hard and flaky while in others they’re soft and pliable (I will admit to having twisted them off, although my horse didn’t seem to appreciate this method). As long as you work within the chestnut’s layers, I don’t think you are going to hurt your horse or “quick” him, as you can with dogs when cutting toenails. I’m wondering if there has been any new research or treatment in the area of Sweet Itch ? I have a wonderful Tenn Walker, but she suffers so every June – October. All I can find are the numerous “home remedies” from the many owners that have crossed this path, but nothing scientifically significant. Joyce, I too have a horse that suffers from Sweet Itch. The only “remedy” I have found is fly spray on a regular basis along the crest of the neck, belly, and base of tail to prevent the flies that cause the irritation from biting or bring the horse inside during the day. I would also move my mare to a paddock as far away from the pond that was generating the flies as I’m told the flies do not travel very far. That seems to have worked well. If you can eliminate the standing water that the flies breed in (much like mosquitos), even better. My instructor also uses blue listerine on her horses’ tails when they get the itch. Hi there – my mare has sweet itch as well and I’ve tried many things in the past few years to deal with it and stop the itch and I have found several things that work really well. SUPER CHEAP and EFFECTIVE methods I’ve found work great!! My mare was so itchy at the beginning of the season, and as soon as I finished putting the diaper rash cream with peppermint oil on her belly she was soo relaxed and stopped constantly kicking at and trying to bite her belly. I highly suggest you give this a try and recommend it to anybody else whose horse has sweet itch! I wish I would have known about this years ago when I first bought her! Give these things a go, I really hope they work as well for your horse as they have for mine! Thanks guys for the info. Let me let you in on what I’m doing and we’re having fairly good luck this year. I use Freedom 45 fly treatment every 2 weeks. She’s in the pasture, which because of all the rain we’ve had, we’re keeping it cut short, but I feed her 1/2 scoop of Total Equine Horse feed with 1/8 – 1/4 cup of flax seed daily. After she eats, I comb her mane and tail really good, give her a good brushing, while checking for any new sores. Usually along the mane, and under the belly. She gets Decadron 5mg IM every Mon and Thur. I mix up equal parts of triple antibiotic ointment, hydrocortisone cream, and vaseline and coat any sores I find. Usually by the next day, she’s cleared up. It’s just a never ending process. I have found that the spray hydrocortisone that you get in the pet dept at your local Wal-Mart works real well getting thru the hair to the tail area. I have to keep her mane cut to keep her from scratching bald spots, but she has a really pretty neck so that’s ok. This is what’s working right now, but am hoping for something simpler to keep her comfortable. Thanks again guys ! You are not alone with having the only horse who grows ugly chestnuts. Draft horses and crosses it is very common to have large long chestnuts and they can have long ergots that need to be clipped as well. I have used hoof nippers for years to cut the ergots and chestnuts off without any problems. My clydesdale/quarter horse mix has the biggest, flakiest, ugliest chestnuts in the world that look like you could just peel them off, but I’ve always refrained from doing this as I didn’t want to hurt him or do something I shouldn’t. Thanks for the advice! Be careful, it is possible to quick your horse even to the point of bleeding. I was using a hoof knife to take down the chestnuts on my spooky green mare and she jerked at something causing the knife to slip and go deeper into the chestnut than I had intended. Took several months to earn her trust and get her to stand calmly again while I trim them. Some horses have a chestnut that easily flakes off in layers, but this mare has very tough fibrous ones that don’t seem to have layers at all, and they’ll jut out for inches if I leave them untended. Even if softened with oil/water you can’t just twist them off. To add another question – why would some horses be missing their chestnuts? I have a 25-year old Icelandic horse who has tiny chestnuts in front (maybe 1/4″ wide, 1/2″ tall) and is completely lacking chestnuts on his rear legs. My APHA mare doesn’t have chestnuts on her hind legs. That always gets comments from my vet and his staff. We joke that my mare is just more highly evolved. How common are no chestnuts? I have an Irish Draught that has 3 ‘normal’ chestnuts and 1 with an entirely different anatomy. It does not grow in layers but in pillars that jut out horizontally. If I let it grow, it looks like the geology of southern Utah laying on its side. I’ve been using a pair of sharp pruning shears to try to keep it in check. I snip one very small part at a time but I’ve still drawn blood being over an inch away from the surface of the skin. It’s a never-ending struggle. I learned as a kid to put Hooflex on them (the gooey sticky hoof dressing, since we always had it around), which is the same idea as petroleum. If you do it for several days in a row, they will either fall off on their own, or you can gently pick at them and they will crumble and flake off very easily. I like to ‘moisturize’ chestnuts on a regular basis to keep the problem minimized, because I always sort of pictured them getting caught on something and ripping, ouch. I have a 12year old Halflinger gelding, he too has large chestnuts. I just keep putting baby oil on them. When they soften up they just rub off. I have always just used sissors. I always clipped them with the hoof nippers when they got a hoof trim. Never drew blood and they never realized I was doing it. Jelly is a bad idea when you have horses with feathers. Do you have a different suggestion for feathered breeds? My Percheron/TB cross has huge chestnuts, too. I keep them under control with good ol’ Bag Balm … very similar to petroleum jelly … sold in a square, green, tin can. After a couple of applications, they soften up and become easy to gently peel away. Your horse will let you know if you’ve gone too deep, so be careful and take it one layer at a time. I always peel my horses chestnuts and on day it made him bleed is this normal???? Chestnuts are actually like a scab. When a goal is in the womb, it’s legs are stuck together in pairs (front and back) so they don’t hurt themselves or the mother. Most horses should have them but it may just depend on the breed. My thoroughbred tends to knock his own chestnuts off when they get too kind so I usually don’t have to worry about removing any.